My dad’s been making this salmon recipe for about five years or so, maybe more, and it wasn’t until recently that I had the gall to attempt it. 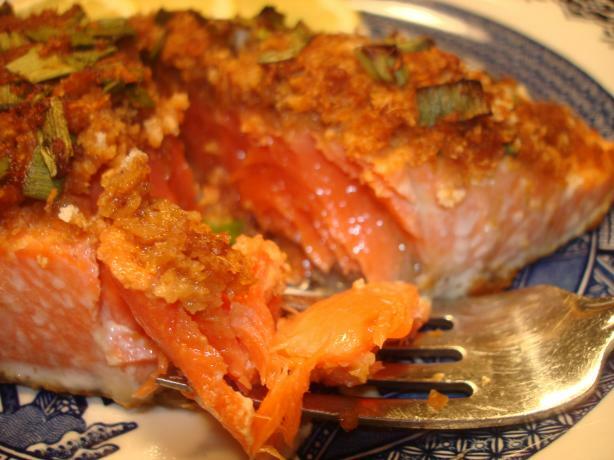 I often order salmon encrusted in (fill in the blank with any chopped nut) in restaurants, and this one drenched in panko crumbs is tough to beat. Don’t even try to leave out the oyster sauce. It adds a sweet thickness to the marinade (vs. just using soy). And I still haven’t managed to find chili paste in the grocery store so we leave that out (and we skip the scallions and fresh ginger, too, if they’re not lying around). This entry was posted in Uncategorized and tagged barefoot contessa at home, barefoot contessa salmon recipe, eli's asian salmon recipe, ina garten, ina garten asian salmon, salmon with oyster sauce, salmon with oyster suace, salmon with panko. Bookmark the permalink.